Looks like this is threat is being reported in your mobile backup? Webroot is unable to remove any files from backups due to the way that OSX is set up. Please have a look at what our Mac Threat Researcher ? has to say in the posts below. Please submit a Submit a Support Ticket free of charge with an active subscription and they can take a look for you. Why is Webrrot NOT finding it on my MAC but it finds it when backed up to a Time Capsule? I formated the Time Capsule, disconnected it, scanned my MAC - it was not found. Now I have reconfigured the Time Capsule, hooked it up to do a full backup and it finds it on the Time Capsule!!!!!!! Beyond frustrated!!!!!! "This file is in the Apple Kext Exclude List, which is a file that Apple uses to allow certain files to run on the machine without Gatekeeper's permission. The reason we are picking it up is because we are looking for a string of code which Apple is also looking for. There is an exclusion in place to allow the file on the actual machine but we do not have an exclusion for backups like this as this would cause an exploit in our detections. The file is not malicous in nature at all." "No need to worry, there isnt a keylogger on your device. Thie file that we are finding is the AppleExcludeList.kext on your backup. We are finding it due to the fact that apple has put the keyloggers information in the file and we are reading that. I suggest that you allow the file, as we cannot remove it and nor should we as it is a legit file. After allowing it please turn off scan mounted drives and this should correct the issue that you are having"
Please see here how to uncheck Scan Mounted Drives. 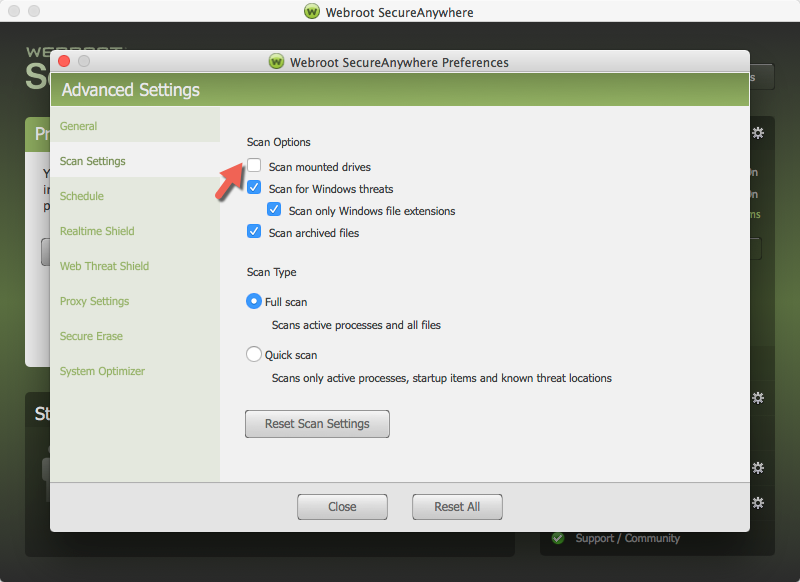 You open Webroot and click on the Advanced Settings in the right hand corner..